Deftly riding the membrane between bathos and transcendence, a beautiful video feedback and computer animation film by Ron Hays with an instant classic synth score by Ragnar Grippe. Ron Hays worked with Nam June Paik’s video Synthesizer and produced some amazing (and often supremely cheesy) music videos and animations in the late 1970s and early 1980s, but sadly died of AIDS in 1991. 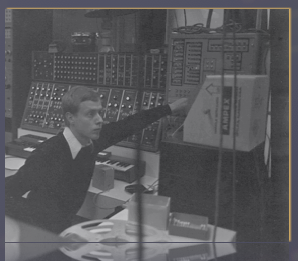 Swedish composer Ragnar Grippe’s web site reveals a rich musical career incorporating film scores, choreography and electronic music, as well as this great photo of him at the controls with a monster Moog modular behind him. Thanks to Rose Kallal for the tipoff.